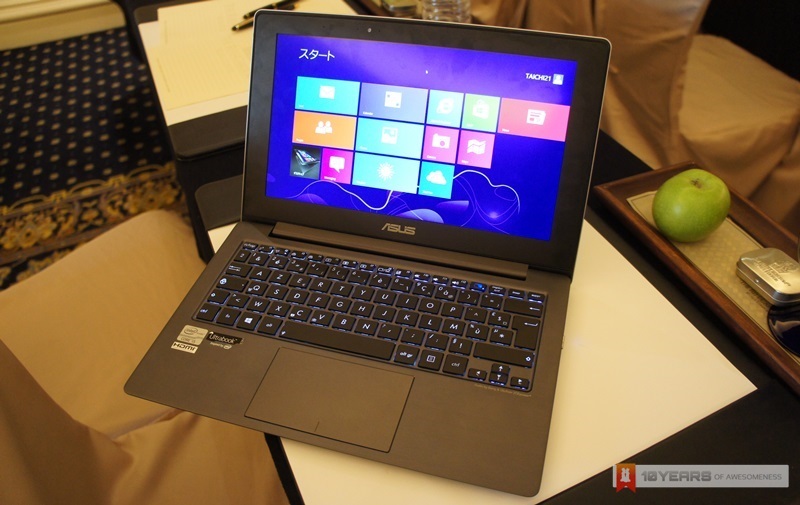 Equipped with two 11.6-inch IPS 1080p full HD display, it is hard to miss the Asus Taichi Ultrabook as it is certainly one of the most unique Windows 8 notebooks in the market right now. 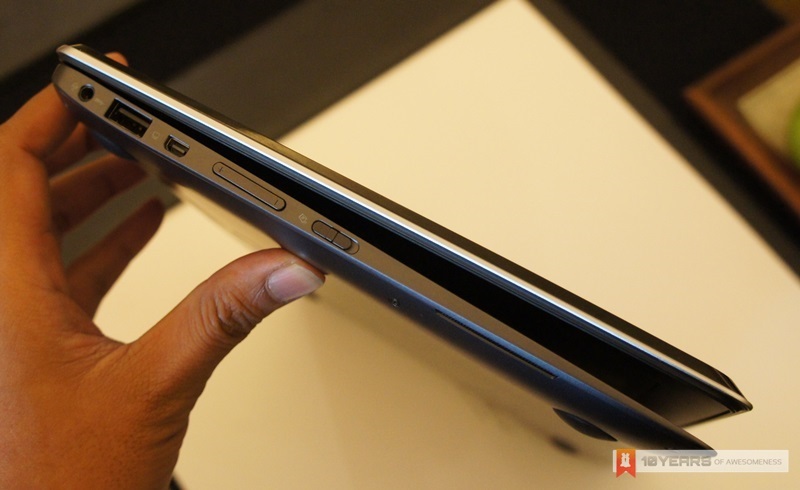 Since one of them is also a multi-touch display, the Asus Taichi can easily be transformed into a tablet just by closing the lid. When the lid is open, the same display can still be used in two ways: mirror and dual-screen mode. In mirror mode, both displays on Asus Taichi will be showing the same image. 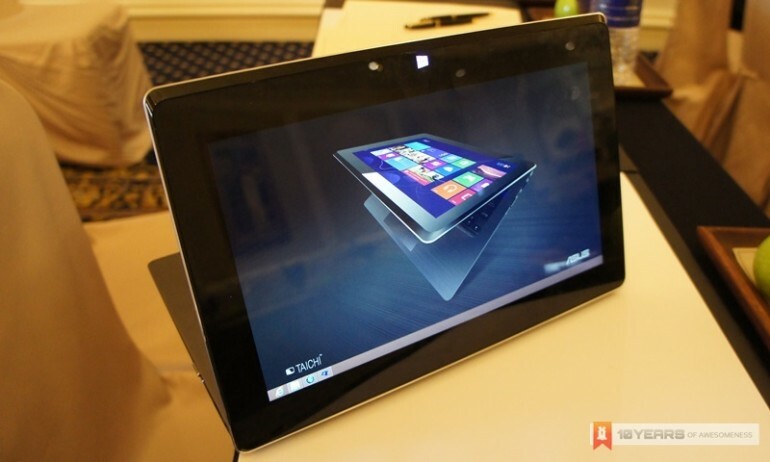 As for the dual-screen mode, the Ultrabook is able to operate as if it is made of two different PC as one user will have the access to the Taichi’s main display, keyboard and touchpad while another user is able to occupy the Ultrabook’s touch-display. 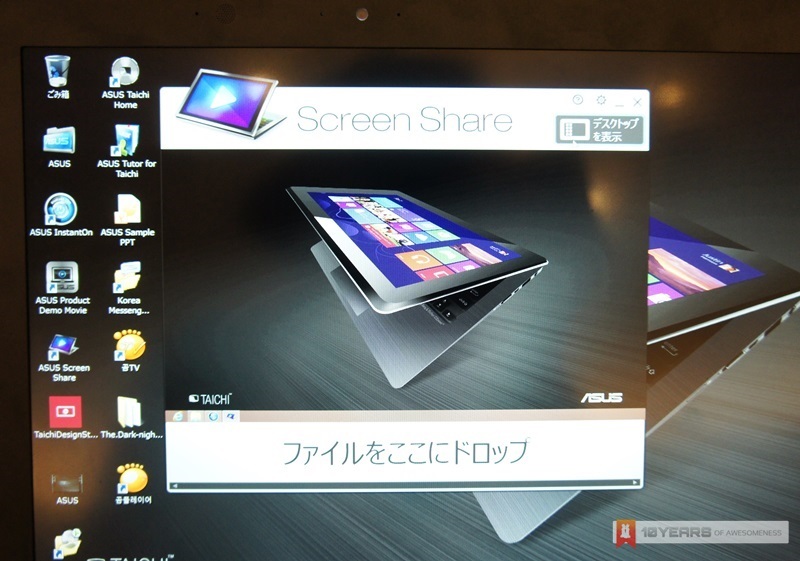 The Asus Taichi’s secondary display, in dual-display mode together with Screen Share app. In certain scenarios such as during a presentation, the presenter is able to restrict what the audience is able to see on the second display by only including the necessary contents into the Screen Share app. Weighing at 1.25kg together with a thickness of between 3mm (minimum) and 16.5mm (maximum), the Asus Taichi Ultrabook is powered by the 1.7GHz third generation Intel Core i5-3317U dual-core processor which also features the integrated Intel HD Graphic 4000 GPU. 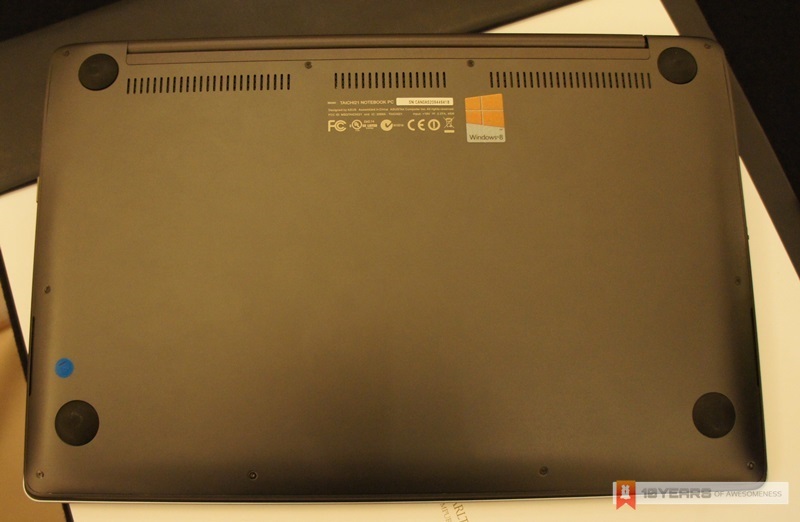 The notebook is also equipped with 4GB of DDR3 RAM, 256GB SATA 3 solid state drive, two webcams with array microphones, and built-in Bang & Olufsen ICEpower audio system that is enhanced by Asus SonicMaster technology. Click on the Read More link below to take a closer look at the new Asus Taichi, which will be available in Malaysia starting from next week onwards with a price tag of RM 3,999. 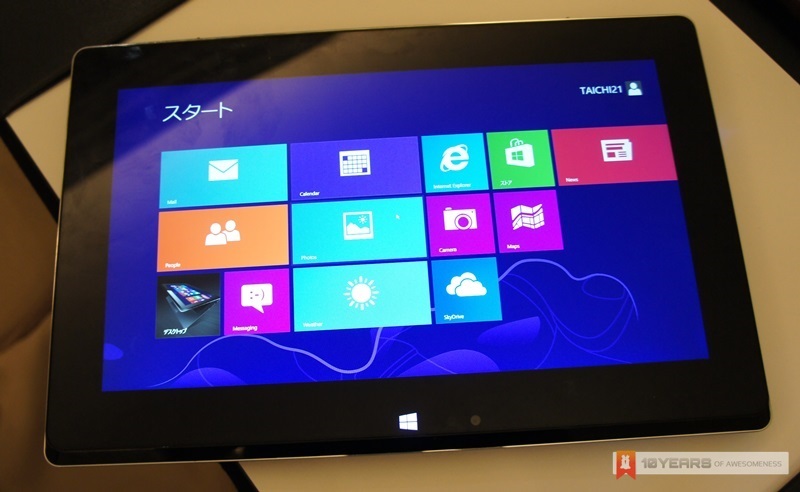 The Asus Taichi in tablet configuration. Just next to the Windows touch button is a 5-megapixels full HD 1080p camera. 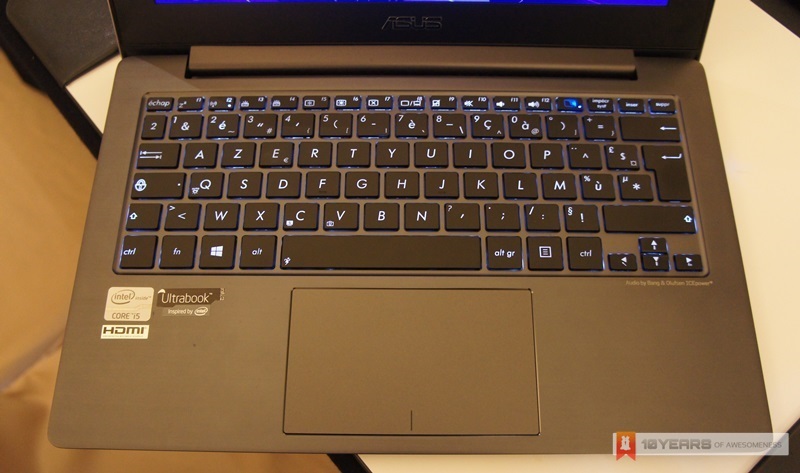 Asus Taichi’s backlit keyboard and touchpad. [L-R] On the left side of Taichi: 3.5mm combo audio jack, USB 3.0, mini VGA port, volume rocker and display toggle switch. 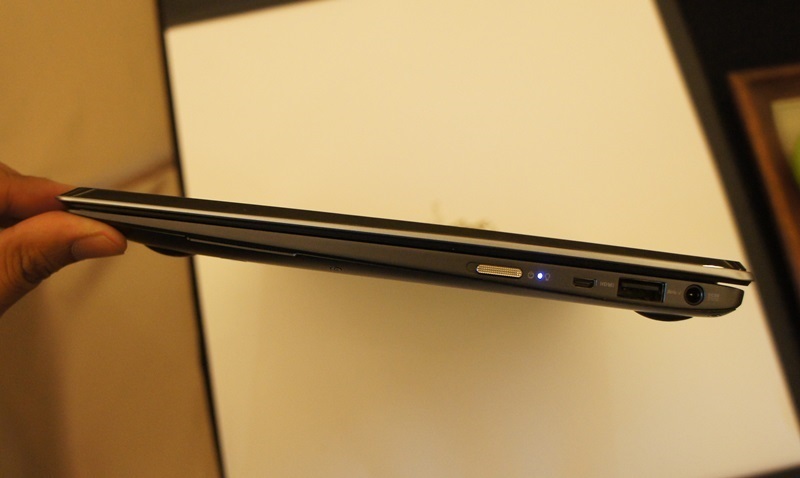 [L-R] On the right side of Taichi: Power toggle button, power indicator, mini HDMI port, USB 3.0 port and power port. The empty underside with the exception of rubber feets, audio speakers and ventilation vents. The Screen Share that we have mentioned earlier. 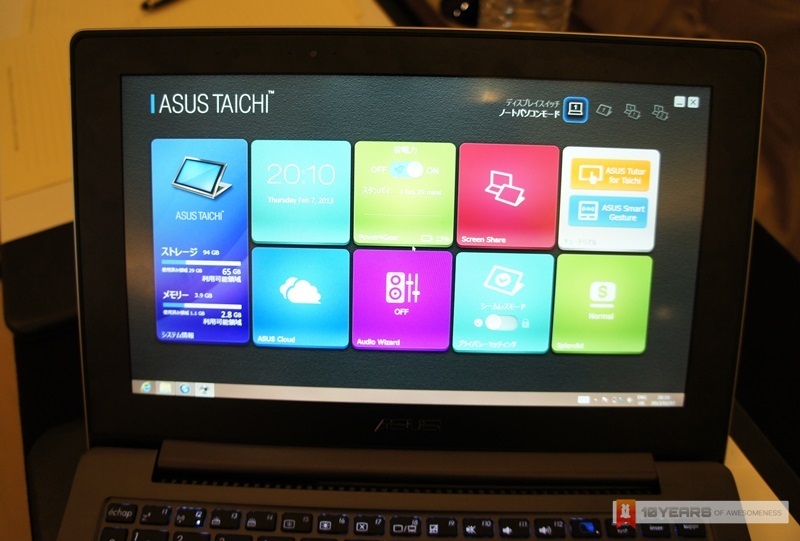 Taichi Home is a software that contains numerous shortcuts to Asus Taichi’s settings and applications. To learn more about the new Asus Taichi, head on to taichi.asus.com.